This amazing 160-page book is perfect for any outdoor lover, poster art fan, or American history buff. The large 9" x 12" full-color hardcover coffee table book includes all 59 of our National Park posters, plus 12 oil paintings, historic photos, a map of the USA, facts, travel tips, and the 100-year history of the National Park Service. 5 years ago, Joel Anderson and his team of award-winning artists set out to create a poster for each of the National Parks. Along the way, Joel and his son Nathan traveled to several parks gathering reference, photos, and inspiration for a book that would eventually combine the entire poster series with a wealth of interesting information. 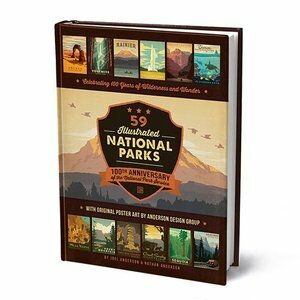 Designed by the talented artists of Anderson Design Group and written by Nathan Anderson, this beautiful National Park book is truly spectacular. Created to celebrate the upcoming 100th Anniversary of the National Park Service, it is sure to be a timeless keepsake.